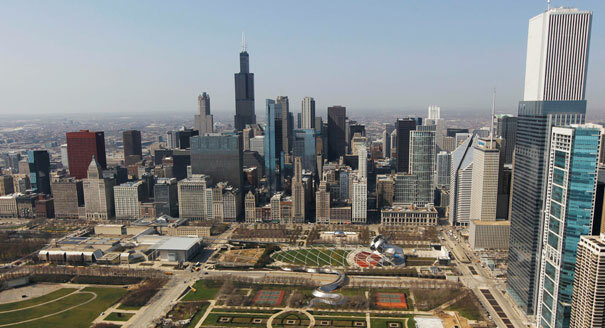 Forbes recently listed Chicago as their fourth most miserable city, behind Detroit, Flint and Rockford—meaning that the states of Illinois and Michigan were having bad days overall. In part of their clearly objective calculus, they listed our high crime rate and weather as signs of our happiness deficit—because math said so. To an extent, I can see where they are coming from. If you’ve ever watched the news, even for a second, you know that crime in Chicago is a problem, and our crime rates on the South Side have been compared to Iraq. I don’t have to tell you about the weather. You don’t coin the word “Snowpocalypse” because everything is rainbows and kittens and sunshine. The weather is terrible, but you live through it. The redness of your skin, as you fight those below-zero winds, gives it character. In most cities, the environmental and infrastructural issues would be cause for misery. But what makes Chicago special is that Chicagoans thrive in almost any condition. When the roads overflowed with snow in 2011 and drivers were trapped on the Dan Ryan, they helped each other to safety. On a particularly blustery January day, we huddle underneath the heat lamps for warmth, bringing shared comfort to friends and strangers. We provide for each other by bringing coffee to our co-workers, who are compatriots in our seasonal agony, and working up a smile, even in the most trying condition. This is because Chicagoans prepare for the worst. Years of bad winters and digging our cars out of yet another blizzard have made us tough and prepared for anything. Why do you think our improv scene in Chicago is so big? It’s because Chicagoans are always ready to say “Yes, and?”—whether that’s with a pile-on joke, a punchline or a shovel. We&apos;re prepared for whatever life throws at us. In most cities, they stay indoors in the snow, hiding as if the apocalypse actually were coming. Here our universities and schools stay open and our baristas show up at 5 a.m., just like always, because we are going to need that extra cup as we brave the sodden trains. It might be an annoyance, and our students complain when school isn’t cancelled. However, our refusal to cancel is an important aspect of our civic character. We refuse to back down, even if that means putting on another pair on Long Johns. This is what we signed up for. And even in the most miserable conditions, Chicagoans find room not just for camaraderie but for joy. When the Snowpocalypse actually shut down DePaul’s campus—which, as a student, was a first—students took to the quad and the streets to go sledding. The empty streets gave us unexpected freedom, and we filled them with the games of our childhood. We built snowmen (and snowwomen) along Fullerton, and the truly adventurous even made snow angels in the middle of the road. The act was reckless and could have gotten the angel maker run over, but it showed we weren’t afraid of anything—whether nature or machine. One of my best friends is from California, where snow is a cause for national emergency, and they don’t share that sense of seasonal community. They don’t have to worry about the skies erupting with ice or a surprise 40-degree day turning back to the dark side by nightfall, when the winter returns to haunt us. The winters are idyllic and peaceful. Chicagoans may beg for a mild season in our worst winters—which we strangely miss during those years when the cold passes us by. Last year I spent most of the fall season in Paris, and when I came back to Chicago for Christmas, part of me looked forward to the season I had grown accustomed to. The benign drizzle of the Champs-Elysees felt improper in mid-December, as if a law of nature were being violated, and when I returned to see that Chicago was the same, I felt like I had been cheated out of something. This wasn’t right. When the site crashed for the Chicago Marathon last week, Chicagoans erupted in outcry, but I wasn’t surprised that half of the city apparently wanted to sign up. Endurance is part of our life cycle, and we know that the finish line is just ahead. There’s nowhere in the world quite like Chicago in the summer, as the city erupts in a three-month celebration of music, food and beer. Our hidden communities come out into the open. Every day is like a Pride parade, and even in 90-degree heat or sudden rain, you can’t stop the party. However, without the winter, those months feel unearned, as if you’ve been given a gift without doing anything to receive it. The winter teaches you to cherish the sun. When May and June roll around, you feel as though you’ve made it. You’re here. It’s like Christmas. Chicagoans jokingly blame the seasons for our high crime rate—quipping that it’s enough to drive anyone off the edge—but they are a symbol of us. Like the winters, our city isn’t easy to love, and sometimes when the Red Line spontaneously sends me to Howard or I’m told the Foster bus won’t be here for another fifteen minutes, I curse that I’d rather live anywhere else in the world. I’d rather live somewhere where our infrastructure didn’t marginalize half of its residents with little public transit, while giving Lincoln Parkers every transportation option in the world. Would it be easier to live somewhere where the schools weren’t a mess, and I didn’t have to ever hear the words "Rahm Emanuel"—whose name is approaching Voldemort status? Yes. But Chicago is my home, and the city has taught me that you fight for your home. You criticize it when it needs criticizing, and you work to improve it. A friend of mine, Wes Perry, recently referred to Chicago as an “ensemble” city, describing our penchant for ensemble-based performance—from Second City to Steppenwolf. However, I think that phrase describes our entire city, a series of ensembles, coming together to ensure the show must go on. To repurpose an old saying, there&apos;s no business like Chicago. Chicago might not be the simplest city ro inhabit, but I can’t think of anywhere else in the world I would live. It wouldn&apos;t be home. Nico Lang writes about LGBTQ life in Chicago. Follow Nico on Twitter @Nico_Lang or Facebook.